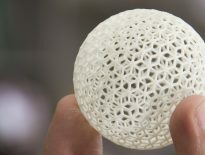 Home » Articles » How do voxels add more detail to 3D printing? How do voxels add more detail to 3D printing? HP has developed a unique voxel 3D printing technology used in the company’s portfolio of 3D printers, featuring the 4200, 500 and 300 series. In short, voxels are 25-micron building blocks, roughly one quarter of the thickness of a human hair. Voxels add more detailed control to 3D printing, such as pinpointing a specific color or mechanical property to a specific segment of the 3D printed part. The HP Multi Jet Fusion’s voxel control technology is not only transforming how we make things, it’s also revolutionizing the way we design them. Voxel control allows designers to break objects down to the smallest nuances of shape, color and function and apply them with microscopic precision. To produce a 3D object using voxels, HP’s Jet Fusion 3D printers start by laying down a super-thin sheet of material less than the thickness of a sheet of paper. A printhead equipped with 30,000 nozzles then swoops over the material, precisely applying chemical fusing and detailing agents to form the shape of the object being created, and then applying infrared heat at very specific levels to make them fuse and do things like rendering objects in full color. But it’s what’s going on inside this mix of materials that’s the real game-changer. HP’s printhead puts out 340 million of these voxel building blocks per second. Not only does that help produce objects 10 times faster than other 3D printing methods, it also gives designers unprecedented control over the details of what they’re making. Previously, 3D design software and printing methods only allowed designers to create objects defined by their surface. But voxel printing technology lets engineers define each voxel’s characteristics both inside and out. 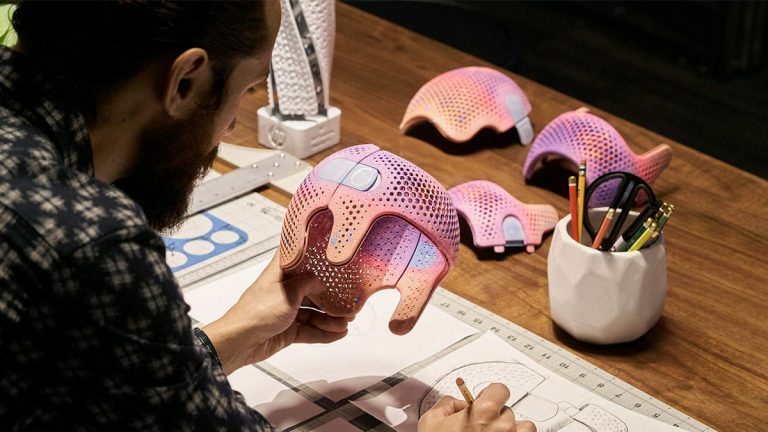 That means designers can go inside 3D printed objects as they’re being printed — depositing and mixing in additional materials, giving each individual voxel different properties in real time, which is at the heart of the breakthrough technology that enables flexible production. With voxel-level control, designers will soon be able to influence the way in which materials bond with each other, allowing them to change the tiniest mechanical properties of physical objects, such as allowing very specific areas to be soft and flexible while others are rigid and hard. For example, by applying agents containing bits of metal to voxels in specific patterns, 3D printed objects could be embedded with functional electronics such as simple circuits, sensors or even wireless antennae. This alone further expands the design possibilities of 3D printing, but micro-level control goes for color, too. Different hues can be infused into individual voxels to create dazzling and unlimited arrays of color configurations to serve a variety of aesthetic or functional applications. It can even help save lives. For example, a surgeon may need a better reference for his patient’s heart than a 2D x-ray can provide. Soon, that doctor will be able to make a 3D scan of his patient’s heart and from it, create an exact replica — with its unique network of multicolored veins and arteries — and then 3D-print it within feet of the operating room, potentially supporting better surgical outcomes for millions of patients. 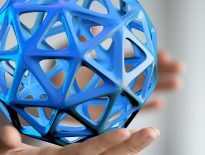 As industrial, medical and consumer product designers start wrapping their heads around the boundless capabilities of HP’s voxel-level 3D printing, they’ll come up with new uses and applications that are hard to even imagine today. The products will be embedded with advanced biosensors that could track medical conditions. And as the range of materials expands to include bioplastics or even lab-grown nerve cells, the tantalizing promise of restoring hearing or sight for more people in more places around the world moves closer to reality. With the advent of voxel 3D printing, the distance between big ideas and physical reality has never been closer.